To some she wasn't very dependable. She was old and worn out. Many people, young and old alike, came to depend on her. When she didn't show up, there were a lot of disappointed people. To some she brought a sense of adventure, an opportunity to travel to places only their imaginations could take them. She'll be replaced by another one; younger, with no bruises, dents or scratches. The younger one will be the talk of the town, and everyone will want to visit her. But the old, broken down one will never be forgotten. 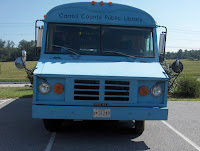 Goodbye Ole' Girl, goodbye Blue Bookmobile. Oh, I hate it when a Bomo dies...or will it be reincarnated (remainered!!) in another location???? It is very sad to see her go! I've had some fun times subbing on her and cruising the highways and byways of Carroll County. She was a good ole' girl wasn't she! I hate to say anything which might be misconstrued-- but-- Blue Lady, you missed your chance at a red hat and it's time to put you in re-cycle! Been great...Can't wait for the new wheels!